Hello, readers! Another week in the Middle East and changes in the Trump administration means the staff and interns had quite a handful of stories from which to make our Week in the Mideast selections. We can only cover a few events here each week so for more comprehensive coverage, follow the TeachMideast twitter to impress your friends and colleagues with your impressive knowledge. We particularly recommend keeping an eye on a number of current or upcoming elections in key countries, including Lebanon, Iraq and Turkey — educators can use these examples to compare different electoral systems and types of government, and also explore varying degrees and effects of citizen participation across the region. On Tuesday, in the United States, the Supreme Court shut down a lawsuit involving human rights claims against international companies, effectively prohibiting civilian plaintiffs from suing foreign corporations for rights abuses committed overseas. At issue was a lawsuit claiming Jordan-based Arab Bank Plc helped finance militant attacks in Israel and the Palestinian territories; a similar decision was recently made when the Supreme Court rejected an appeal demanding that the Palestine Liberation Organization and the Palestinian Authority pay $656 million to American victims of terror attacks for similar reasons. According to data from Israel’s Shin Bet security service, there has been a sharp increase in the number of attacks by Jewish extremists against Palestinians in the West Bank this year. Last week, five hate crimes were perpetrated in Israel and the West Bank. On Sunday, car tires were slashed overnight in a suspected hate crime in the Arab West Bank town of Turmus Ayya, near Nablus. Graffitti was also sprayed in the vicinity, reading “Let us take care of them.” Israel Police launched an investigation but has yet to arrest suspects. Attacks on Palestinians or their property has rocketed, primarily in the Nablus area, with the number of such incidents in 2018 already exceeding the total number for all of 2017. 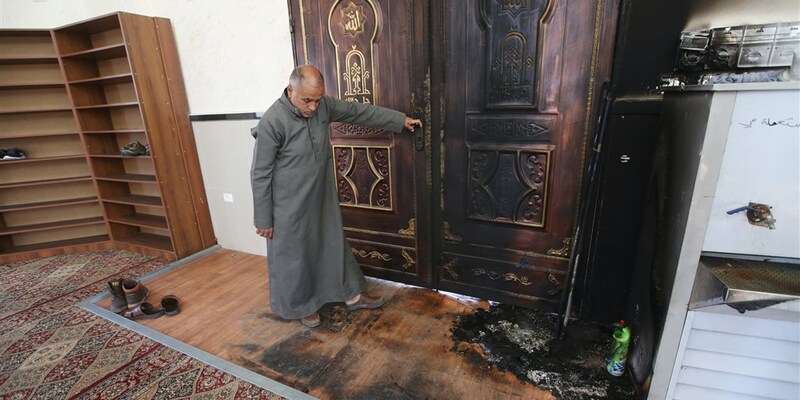 In one incident earlier this month, a mosque was set ablaze in the village of Aqraba, the first incident of its type in nearly three years. Around 18 alleged hate crimes have taken place this year against Palestinians and have included vandalism, the puncturing of vehicle tires, and two incidents that were deemed attempted terror attacks – including the arson incident. In the previous 12 months, there were eight suspected hate crime attacks and five terror attacks directed at Palestinians. The term “price tag” is used specifically in reference to attacks in which Jewish extremists set fire to or desecrate property belonging to Palestinians or left wing Israelis — the name alludes to the price the extremists seek to extract for the loss of illegal settlements. “Price tag” is often spray painted in Hebrew at the site of such attacks. On Thursday, President Trump tweeted his support for the North American bid for the 2026 soccer World Cup, and issued a thinly veiled threat to nations that might oppose it. “The U.S. has put together a STRONG bid w/ Canada & Mexico for the 2026 World Cup,” Trump tweeted. “It would be a shame if countries that we always support were to lobby against the U.S. bid. Why should we be supporting these countries when they don’t support us (including at the United Nations)?” Morocco is the only rival to a joint bid to stage the event from the United States, Canada and Mexico, with the FIFA Congress due to choose the hosts in Moscow on June 13. He and members of his administration have issued similar warnings to countries who have opposed U.S. policy, such as when he threatened to cut off U.S. funding to countries that supported a resolution criticizing his decision to recognize Jerusalem as Israel’s capital in December. On Friday, the Geophysical Research Letters reported dismaying findings on “dead zones” in the Gulf of Oman. Thanks to data collected by remote-controlled submarines called “Seagliders,” researchers confirmed the existence of a nearly oxygen-less area the size of Florida in the Arabian Sea. The robots are roughly the size of a small person, but with a much greater diving capacity: they can spend months at a depth of 1,000 meters. Access to these waters had been heretofore hindered by “piracy and geopolitical tensions.” Marine plants and animals rely on oxygen to survive and therefore can’t live in a dead zone. These zones also have implications for climate change because a lack of oxygen alters the nitrogen cycle, producing the greenhouse gas nitrous oxide, which is 300 times more potent than carbon dioxide. The findings bring concerns that one of the world’s busiest shipping lanes — which is also a key fishing area — is facing an environmental catastrophe. Also on Friday, Voice of America reported that a new law in Syria requires the 13 million internally and externally displaced Syrians to return and register their properties with the local authorities. If property owners fail to meet the May 10th deadline, the government will confiscate their homes. The change of property ownership will result in large profits for the Assad regime and its supporters, worsening the situation for the refugees and displaced, who will face further economic and housing challenges. The law will place the refugees in an uncomfortable situation, “… trapped between host countries that do not want them and a Syria to which they cannot return.” Not only will it be logistically difficult for many to return, but affiliated members of opposition movements fear for their lives if returning. The situation will require more assistance from the international community as refugee-hosting countries continue to carry the burden; however, a recent joint EU-UN donor conference raised only half of the $9bn needed to provide sufficient humanitarian aid. Turkish deputy prime minister expressed disappointment that other countries were not doing enough to help host states refugees while the the Jordanian foreign minister warned that the law could help create a “new army of Islamic State” unless proper measures are taken. This new law have many similarities with the ‘absentees law’ that allowed Israelis to take land from the Palestinians in 1948. 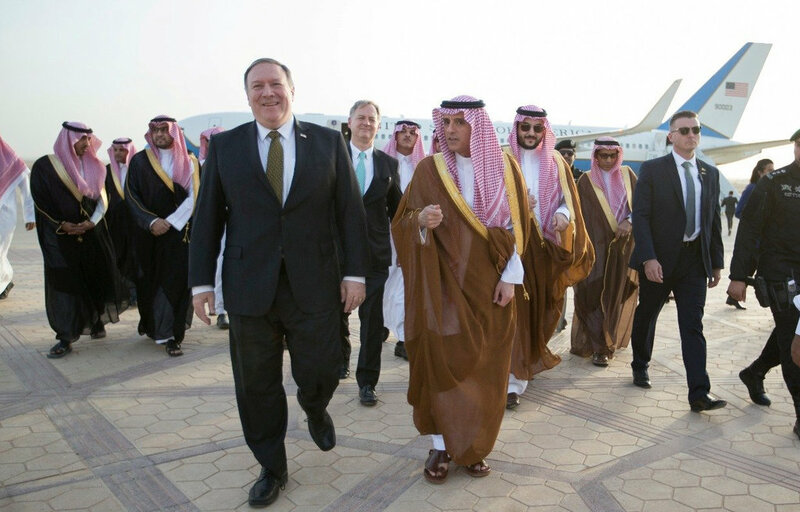 Secretary of State Mike Pompeo was met by the Saudi foreign minister, Adel Al-Jubeir, upon his arrival in Riyadh. Credit: Saudi Press Agency. Over the weekend, new American Secretary of State Mike Pompeo told senior Saudi officials during his first official overseas visit that it is time to end the blockade of neighboring Qatar. Pompeo met with the foreign minister, Crown Prince Mohammad bin Salman, and King Salman. The New York Times reported that, “As Saudi Arabia considers digging a moat along its border with Qatar and dumping nuclear waste nearby, Secretary of State Mike Pompeo arrived in Riyadh with a simple message: Enough is enough. Patience with what is viewed in Washington as a petulant spat within the Gulf Cooperation Council has worn thin, and Mr. Pompeo told the Saudi Foreign Minister, Adel al-Jubeir, that the dispute needs to end, according to a senior State Department official who briefed reporters on the meetings but who was not authorized to be named.” Last June, Saudi Arabia and the United Arab Emirates led an embargo by four Arab nations of Qatar, accusing the tiny, gas-rich nation of funding terrorism, cozying up to Iran and welcoming dissidents. Years of perceived slights on both sides of the conflict added to the bitterness.